Once I made the decision to self-publish some of my material, I was still cautious about diving in all the way. I decided to start by compiling a collection of some of my stories that had already appeared in magazines and anthologies. I would do the collection in print and electronic editions, and also publish the stories electronically as individual entities. I had other stories, original stories, that I felt were good work that had made the rounds and not sold, but though it didn’t take me long to decide to do so, I wasn’t quite ready yet to self-publish new material. Most of the stories were set in India or thereabouts, so I decided that would be the theme of the collection. In the end, I added a few unrelated stories, and even one original story to bring it up to the word count I wanted, but most of the stories were previously published and had that Indian theme and flavor. They were some of my first-written and first-published works, and my mind had been full of my experiences in the East when I wrote them. At first I called the collection “Ceasefire and Other Stories,” as the story “Ceasefire” was very important to me, and I rather liked the connotations. 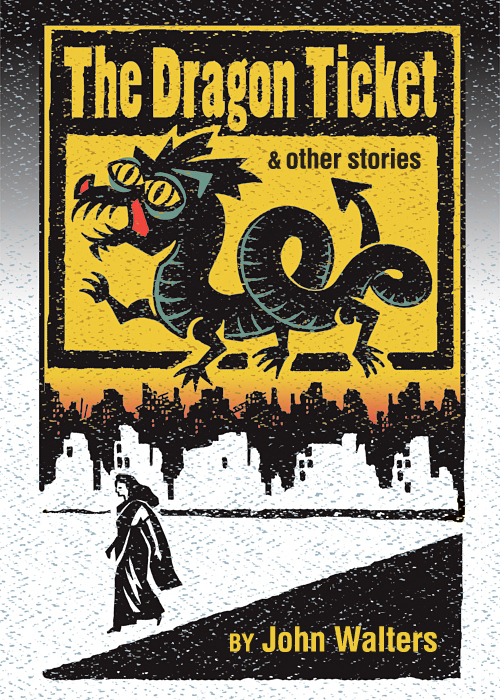 But after a period of rumination, I changed the title to “The Dragon Ticket and Other Stories.” Not only did the title have more zing and offer more cover possibilities, but I wanted to open the collection with the title story, as “The Dragon Ticket” has a bit of a faster start to draw readers in at the beginning of the book. I wanted to write introductions to each story, but then I realized that to deal thoroughly with any thoughts I had about the material would inevitably lead to spoilers, and I did not want to ruin the experience of surprise for those who were reading the stories in the collection for the first time. So instead I decided to add an afterword to the book in which I would include essays on each individual story. The reader could read or not read this last section, but whatever notes a writer shares about stories for me personally is as inspiring to read as the stories themselves. I wrote about the genesis of the story, what initially inspired it, any parallels to my own life, and any thoughts the subject or theme of the story inspired in me. I intended the afterword to link the short story collection to my larger body of work, especially my memoir-in-progress which was not yet published. Fiction is as much a personal expression by a writer as the retelling of an actual life event. The cover for the book was done by relatives who are professional graphic artists. They spent a lot of time on it, coming up with a beautiful original illustration that succinctly captures the theme of the collection. Their digital and print covers for the book greatly enhance its appearance. I did the formatting for both the digital and print books myself. To do so, from the Smashwords website I downloaded Mark Coker’s e-book “Smashwords Style Guide.” I printed it out and studied every word of it, and as I formatted my book I went over it again and again. I knew nothing about formatting, so there was a lot to learn. Not only did I have to learn how to redo the entire text so it would read well when published electronically, but I also learned how to create a hyperlinked table of contents, so that readers could jump to any story they wanted and then jump back to the table of contents. The electronic version, though, was the easy part. The print formatting took much longer to learn. I did it all in Microsoft Word. Day after day I would pore over help pages on the Internet, working out bugs in the print formatting. One of the toughest things I had to deal with was creating page numbers. Not because it really is difficult, but because I had never done it before. One little thing would go wrong and it would sometimes take me hours to track down the problem and set it right. Often it was the tiniest of tweaks, but if I didn’t know how to do it, the result was endless frustration. Finally, though, I got the file finished. I sent it to my graphic artist relatives for their perusal; they sent it back with suggestions. After several such exchanges I had a satisfactory PDF copy of the print text. Next, when everything else was ready, was the uploading. I uploaded the book to three sites: Amazon Kindle electronic publishing, Amazon CreateSpace print publishing, and Smashwords, which handles electronic distribution to book vendors such as Barnes and Noble, Apple, Kobo, Sony, and others. I did not then have the option to upload directly to Barnes and Noble because I was still living in Greece, and Barnes and Nobles only accepted uploads from the United States. One other detail I had to attend to was opening a bank account in the United States, which one of my sons helped me to do, wherein the vendors could direct deposit hypothetical royalties. Once I had the cover files, the book files, and the bank account, the rest was fairly easy and straightforward. You create accounts on these websites, fill in your personal and financial data and details on the book, including a blurb, or brief compelling description. It was thrilling to see the book for sale in the electronic bookstores, but it was much more thrilling when I finally received my print proof copy from CreateSpace. Nothing can describe the thrill of seeing the culmination of your work in physical form and holding it in your hands. It was my newborn baby. I gazed at the cover, read the cover copy, opened it slowly and pored over the first few pages as if someone else had written it. I skimmed through and paused at each story title, read the first few paragraphs, and imagined how a reader would feel. I was (and am) proud of that first book, and I sent copies to my father and brother and sisters. I also sent a copy to Kristine Rusch and Dean Smith with my sincere thanks for sharing the lessons that had led to its creation. I didn’t expect “The Dragon Ticket and Other Stories” to jump right onto the bestseller lists, and it didn’t, but it is good work, and I realize more clearly now than I did back then that it was right for me to do it when I did. Yes, the publishing world had changed. The so-called gatekeepers were being too prohibitive, too exclusive. Self-publishing was like a wonderful burst of fresh air in an industry that had become inhibited, stuffy, exclusive and creativity-strangling. Too much of great beauty had been moldering in trunks because the powers-that-be refused to touch it – or worse yet, had so many guards at the gates that they never even got a look at it. Hopefully, those days are gone forever. Writers can now take their work directly to readers and let them decide. This entry was posted in On Writing and tagged Amazon Kindle self-publishing, CreateSpace print book publishing, formatting self-published books, Mark Coker, self-publishing, Smashwords Style Guide, Writing. Bookmark the permalink.